COLUMBIA, Mo. – The No. 11 Kentucky volleyball team clinched the 2018 Southeastern Conference Championship on Sunday afternoon with a 3-0 sweep (25-17, 25-22, 25-18) of No. 23 Missouri at Mizzou Arena behind its second-best offensive effort of 2018, hitting a staunch .460 for the match. It is the seventh SEC crown for Kentucky in program history and first time winning in back-to-back seasons since 1987-1988. We're headed back home with some hardware for the trophy case. Sunday marked the eighth-straight sweep for Kentucky, who improves to 21-4 overall and remains perfect at 16-0 in the SEC. Mizzou falls to 22-7 and 12-5 in league play. Junior Leah Edmond, who passed Whitney Billings to become UK’s all-time kills leader in the 25-point rally-scoring era during today’s match, led the way with 22 kills on 41 swings for her second-best hitting percentage of the season at .439 and her seventh match in 2018 with at least 20 terminations. Edmond set her career-best total earlier this season against Missouri with 26 kills at home on Sept. 30. She has posted a combined averaged of 6.9 terminations per set against the Tigers in the two meetings. Freshman outside hitter Alli Stumler matched her career best with 15 kills for the second time in three matches. It’s the third time she’s posted the number this season. Stumler compiled a red-hot .438 clip, which is also her second-best effort of 2018, with just one error, guiding her to three straight matches with at least 10 kills. Sophomore setter Madison Lilley notched her ninth double-double of the season and 20th of her career after posting 40 assists, 10 digs, two blocks, two kills and an ace. It’s her second double-double in the last three matches and 13th time she’s posted 40 assists this year. Sophomore libero Gabby Curry led UK with 12 digs and matched her career high seven assists. Senior middle blocker Brooke Morgan added six kills on nine swings and five blocks, giving her 11 matches in a row with at least three rejections. Sophomore middle blocker Kendyl Paris and junior opposite Caitlyn Cooper both came up with four kills. UK will look to win the league outright on Wednesday night in Columbia, South Carolina, against the South Carolina Gamecocks. The match will have a first serve of 7 p.m. ET. Kentucky wraps up its regular season with a home match against Auburn on Saturday for Senior Night. After a back-and-forth opening sequence, Kentucky made the first meaningful run of the set at 5-0 with two kills each from the Stumler and Cooper tandem with a Mizzou error to take an 8-5 lead and force the Tigers into calling their first timeout of the set. Edmond recorded her fourth kill in the set to put Kentucky up 14-10, breaking the all-time kills’ record at Kentucky. She also moved into the top four on the all-time list. An attacking error by the Tigers on the succeeding point saw UK’s lead expand to 15-10 – the largest of the set to that point. Edmond continued to pummel the Tigers, with her team-leading sixth kill of the set to put UK up 19-13 and force the Tigers into calling their second timeout. Morgan recorded her second kill of the match from the right side on a cross-court winner and Kentucky closed out a 25-17 set win. The Wildcats hit .500 in the opening frame, led by Edmond’s six kills. Kentucky started the second set on a 3-0 run, and Mizzou fought back to tie the frame at 6-6 on an error by the UK attack. The Tigers went on to score six of the next eight points in the match to take their first lead at 12-9. After Kentucky responded with three of the next four, two UK errors saw Missouri take a three-point lead into the media break at 15-12. Kentucky was hitting just .286 at that point in the set and had four errors through the opening 27 points. Stumler hit a nice cross-court kill to pull the Wildcats to within one at 19-18 and then an ace to put Kentucky on level terms at 19 all and Mizzou called timeout after UK scored seven of the last 11 points and four of the last five. Back-to-back kills by Stumler forced Mizzou into its final timeout as Kentucky took a 21-19 lead. Lilley came up huge for the Wildcats in the final points of the frame, setting a Stumler kill to set up set point at 24-22 and then a nice pass leading to an error by the Tigers as Kentucky wrapped up the second set, 25-22. It marked Stumler’s third match in a row with double-figure kills. After the first 10 points were even, Kentucky pulled off to an early lead with the aid of a 4-0 run thanks to forcing the Tigers into four consecutive attacking errors. The Tigers called a timeout trailing 9-6 as the Wildcats jumped strong out of the gates. Leah Edmond’s 17th kill of the match expanded the UK lead to 11-7 – the largest it had been all set to that point. Lilly and Morgan followed with a huge block on the right side to put UK up five. Morgan has now come up with at least three blocks in 11 matches in a row. Edmond had three straight kills on the succeeding points and the UK lead ballooned to 17-10. The third kill of that streak was her 20th of the match, marking her seventh match with at least 20 kills. 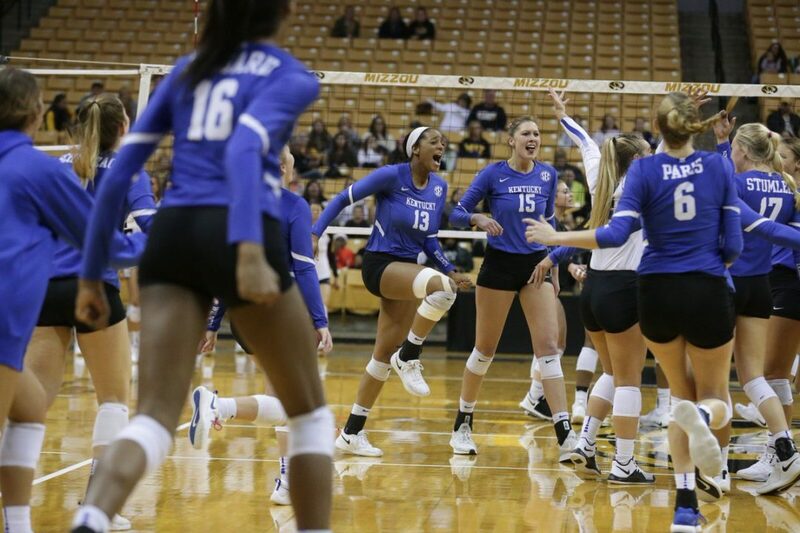 The Wildcats clinched the SEC title with an attack error by Mizzou to win the third set, 25-18. COLUMBIA, Mo. – No. 23 Mizzou Volleyball (22-7, 12-5 SEC) fell 3-0 (17-25, 22-25, 18-25) to No. 11 Kentucky Sunday afternoon inside Mizzou Arena to conclude its 2018 home schedule. The Tigers’ regular season finale is slated for Wednesday (Nov. 21) at LSU. First serve in Baton Rouge is scheduled for 6 p.m. CT and the match will broadcast live on ESPNU. Next Sunday (Nov. 25) will mark the 2018 NCAA Tournament Selection Show. Mizzou will learn its postseason destination at 7:30 p.m. CT on ESPNU. Alyssa Munlyn‘s lone solo block against Kentucky pushed her career total to 118. She now stands alone in second place for most career solo blocks in Tiger history. With one regular season match remaining and NCAA play following, the Suwanee, Georgia, native will need four additional solo blocks to move into first place all-time. Deberg tallied her 15th multi-ace match this season (ninth in SEC action). Her 56 aces this year rank fourth-most in Mizzou single-season history. Omazic was the Tigers’ most efficient attacker Sunday, as she surpassed .400 hitting for the seventh time this season. It was her highest single-match hitting percentage since posting a .583 mark on Oct. 5 vs. South Carolina. Hollingsworth also swung well against the Wildcats, recording .300-plus hitting for the fourth time in her past five matches played. Mizzou showed offensive balance despite the loss Sunday, as four Tigers posted eight-plus kills. Member-Meneh and Hollingsworth paved the way with nine kills apiece.